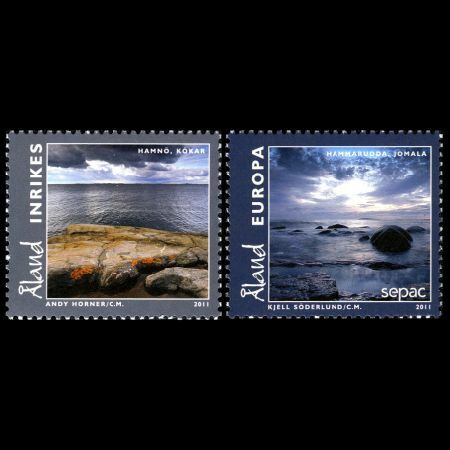 On September 289th, 2011 Post Authority of Aland - Aland Posten - issued a set of 2 stamps, shows some local landscapes. Jomala island, well known fossil found place of Aland, can be seen on one of these stamps..
On the Aland islands between Sweden and Finland in the Baltic sea, you can find fossils from the Ordovicianperiod. This is a only place in Finland where you can find fossils. This fossils can be seen in University Museum in Helsinki. East of the main island there is a 9 kilometre diameter crater (Lumparn). This crater was formed by a meteor or comet impact 1200 to 500 milion years ago.It is possible to go to the Finnish Aland Islands by ferry from the Swedish or the Finnish mainland. The best spot to collect fossils is Yttern's on the Jomala island. The finds consist of trilobites and gastropods from the Ordovician period. Some farmers allow to tourist to collect fossils on their fields at Ordovician limestone blocks. Many farmers, however, don't like collectors and soon it will be also illegal export fossils for Finland.